White Raspberry Poke Cake tastes just like white wedding cake but is so much easier to make! I have to confess that I’m not much of a wedding person. When my husband and I got married, there wasn’t much that I really had a strong opinion about – except for the cake. I let my bridesmaids pick out their dresses and choose the colors. I had almost no opinion about things like the flowers or the table linens, but I really wanted a pretty wedding cake that tasted good. Priorities, right? And my favorite wedding cake flavor combination is white cake with a hint of almond flavor with raspberry filling. It is uh-maz-ing!! With this White Raspberry Poke Cake recipe you can enjoy wedding cake without all of the work. The cake is a cinch to make, but it is so ridiculously good that no one will guess just how easy it is. The cake itself is light and tender, and the pie filling is the perfect topping. I love that raspberries are the perfect combination of sweet and tart! 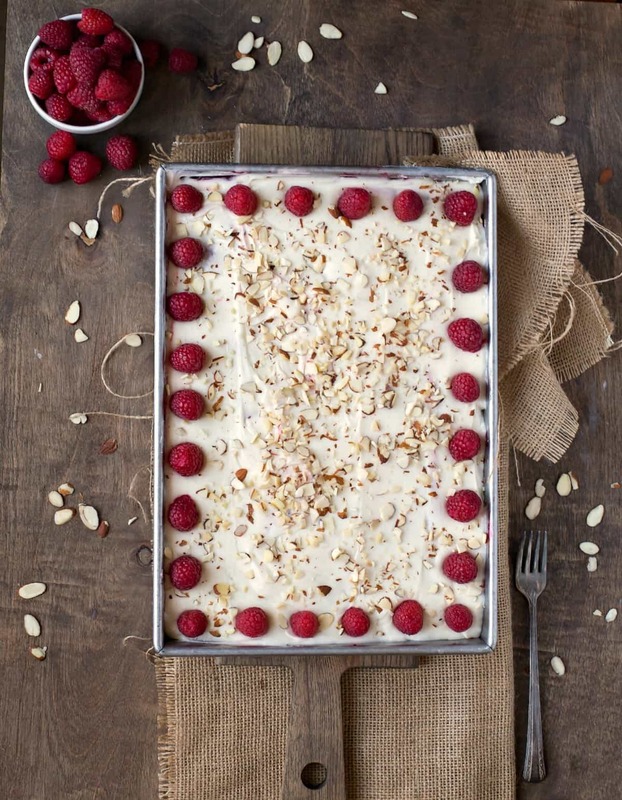 Then the cake is topped with a vanilla/almond cream cheese frosting, more raspberries, and almonds. 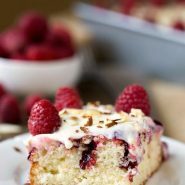 I knew that it was going to be love at first bite with this White Raspberry Poke Cake, and I could hardly stand to wait while this cake chilled until dessert. It was so worth it, though! This is hands down one of my family’s favorites. Do yourself a favor, and make this cake! More recipes that begin with a cake mix! 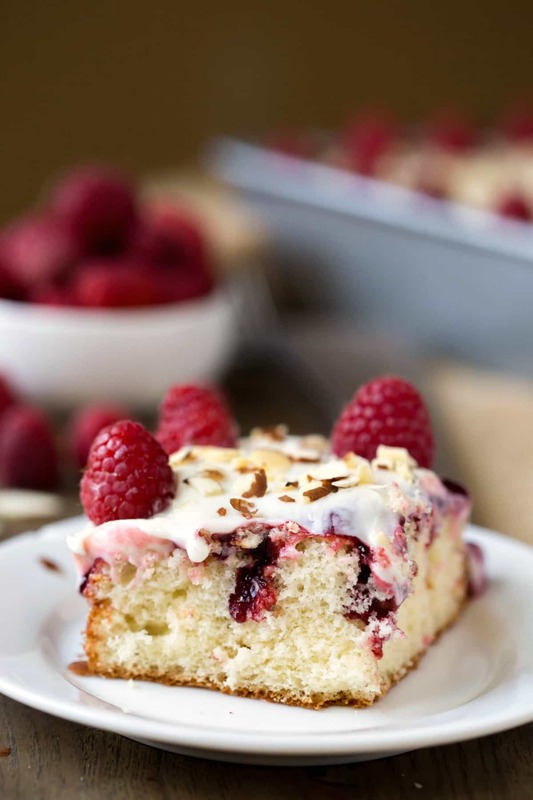 If you’ve tried this white raspberry poke cake recipe, don’t forget to rate the recipe and leave me a comment below. I love to hear from people who’ve made my recipes! You can SUBSCRIBE to receive my latest recipe newsletters or FOLLOW ME on FACEBOOK, INSTAGRAM and PINTEREST for even more delicious food. Preheat oven to 350 F. Grease a 9x13-inch baking dish; set aside. In a large bowl, mix together cake mix, eggs, milk, water, butter, and extracts on low for 30 seconds. Turn speed up to medium, and mix together for 1-2 minutes, or until combined. Bake for 20-30 minutes, or until a toothpick inserted in the center comes out clean. Using the handle of a wooden spoon (or similar instrument), poke holes in the cake (I poke about 35). Pour the fruit filling over warm cake, gently spreading as necessary. Let cake cool to room temperature. To make the frosting, beat together cream cheese and butter until combined. Add powdered sugar, 1 tablespoon milk, and extracts. Beat together until well-combined. Mix in milk to reach desired consistency. Spread frosting over room temperature cake. The easiest way to do this is to drop frosting evenly over cake and then gently spread to combine. Just before serving, top with fresh raspberries and sliced almonds. Cover and chill any leftovers. *Use 1 teaspoon for a mild almond flavor or up to 2 teaspoons for a more pronounced almond flavor. Thank you so much for sharing this recipe. I made your White Raspberry Poke Cake for a friend’s birthday and it was a huge success. My son had told me to bring home any leftovers, didn’t happen. Guess it didn’t help that his dad had 3 pieces!! Thanks again!! Yay!! I truly love to hear stories like this, and I’m so glad that they were a hit! I appreciate your note! I’ve only tried this with one brand of filling, and I’m sure your tips will help anyone else who has that issue. Thank you! Fantastic! This was one of the best cakes I’ve made. Anyone familiar with the filling? I have never used raspberry filling before. Does it have seeds in it? That would be a deal breaker for my picky eaters. It has pieces of mashed raspberry in it, and there are some seeds. I’m not sure whether or not any other brands are seedless. If the seeds will be an issue, you could try putting the filling through a fine mesh strainer to remove them. Hope that helps! I’m hoping you see this and can respond. I plan to make this for Easter tomorrow (along with 3 other items). Could I make this today and refrigerate it all overnight? I really want for it to taste super fresh! Thanks!! That’s gorgeous! Raspberries and almonds are a winning combo!